HEAD's Vector 155 CT provides incredible power in every shot. A revolutionary shaft design with Corrugated Technology™ has been combined with Metallix™ and MicroGEL™ technologies for a stronger, stiffer and more powerful racquet with amazing feel. Corrugated Technology™: A revolutionary shaft deign that optimizes power. Corrugates rails are incorporated into the shaft of the racquet creating up to 12% more stiffness than a conventional racquet design. This provides superior torsion, bending and handling for optimum power in every single shot. MicroGEL™: MicroGEL is a revolutionary silicone based material with the lowest density of any solid known on the planet. This incredible "Super Material" weighs only about 3mg per cubic centimeter, but is able to support up to 4,000 times it's own weight. 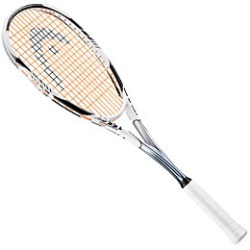 HEAD has combined MicroGEL with stiff and strong carbon composite fibers to create a racquet with incredible responsive qualities. On ball impact, HEAD MicroGEL uniformly distributes the impact load around the frame circumference providing a rock solid feel and unique touch that has to be experienced to be believed. Metallix™: Unchain the Power with Metallix, a specially developed matrix of carbon fibers and a new crystalline metal alloy with a grain-size 1,000 times smaller than conventional metal setting a new standard for power in the sport of racquetball. Strategically used in the throat area of the racquet where conventional racquets tend to bend and lose power, Metallix creates a stronger, stiffer and more powerful racquet.